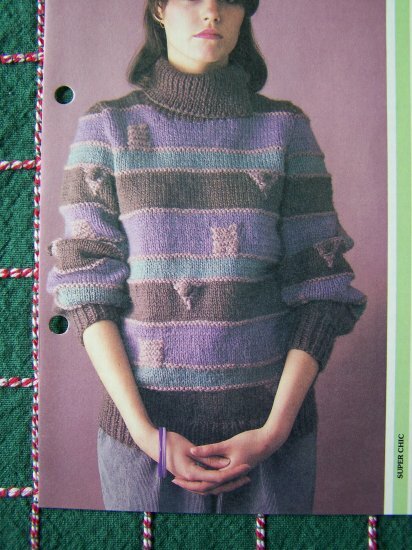 1980's Vintage knitting pattern for women; 80's misses striped pullover bulky sweater with triangles and squares knitting pattern. Knit in bulky weight yarn. Original pattern not a copy. Includes only the pattern not the completed item. 100's more listed. Book 15. Pattern name: Super chic : Striped sweater with triangles and squares. Measurements: Bust 32 - 38". Actual measurement 36 - 42". Length from shoulder 26 - 27". Sleeve seam 18". This pattern was removed from a two ring binder and some may have edge curl from being in a binder for so many years. S & H to the USA 1 penny folded and mailed in an envelope.